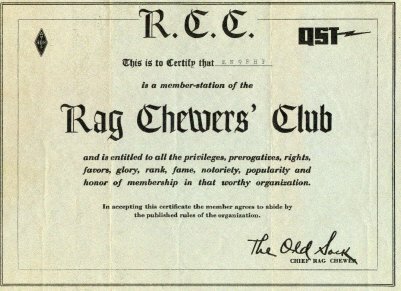 The Rag Chewers Club was an American Radio Relay League sponsored award that was rather easy to obtain and thus was usually the first award received from the ARRL. If I remenber correctly, you had to talk to another RCC member for a half hour. This was not as easy as it sounds if you were a brand new novice licensee with a limited knowledge of Morse code, Does RCC still exist? I suspect that it is just one more organization that I had joined and is now defunct. As Groucho Marx once said: "I wouldn't join any club that would have me as a member."